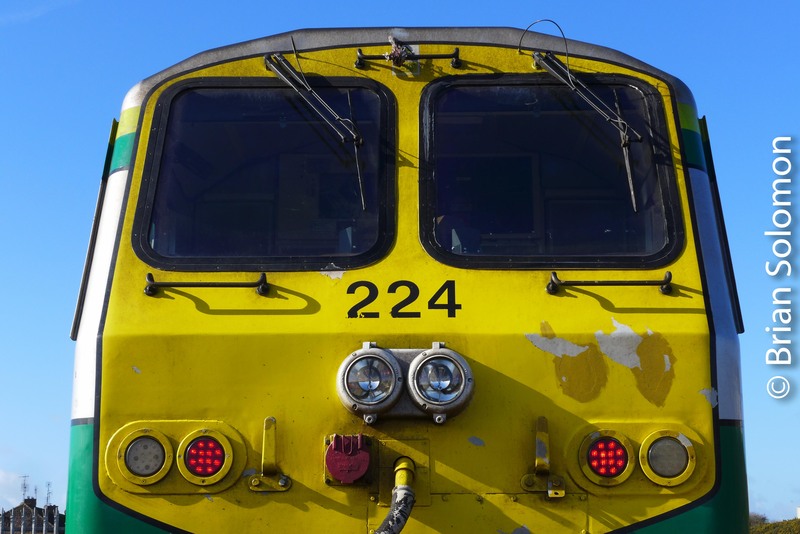 Last in the Series: Irish Rail 234. 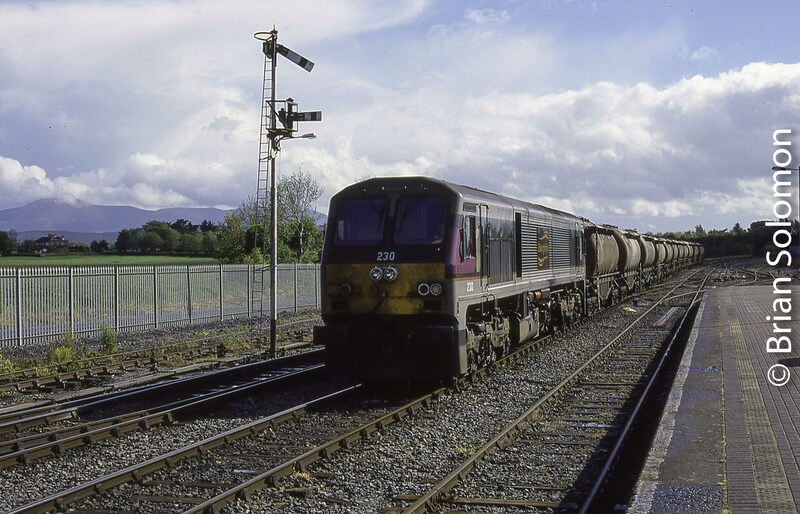 This is my final Irish 201-class diesel posting in my 2018/20-year retrospective series. 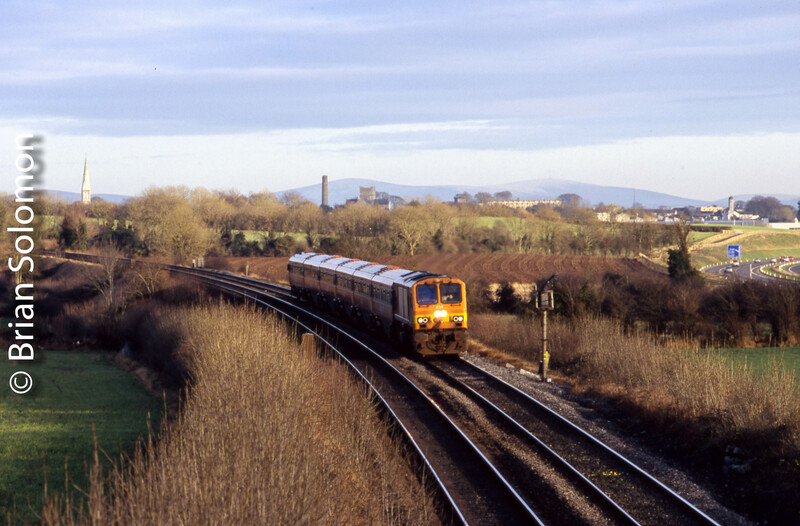 Irish Rail’s ‘down Waterford’ at Cherryville Junction, Co. Kildare, 23 January 2005. Exposed on Fujichrome Provia 100F. 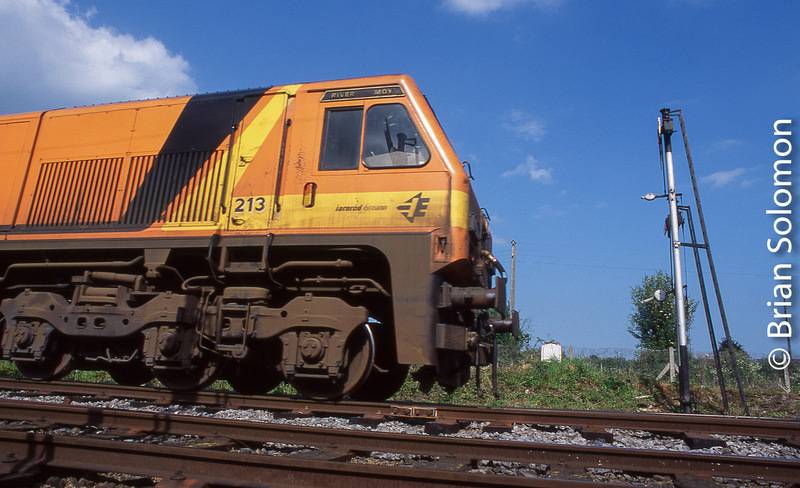 I have to admit, old 234 isn’t my favorite, and there’s a bit of, ‘ah not that one, again.’ But so be it! 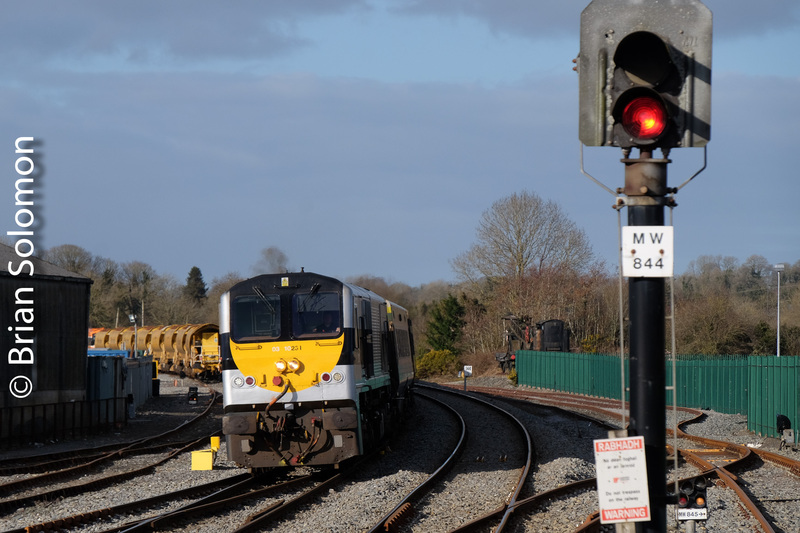 If we ever need photos of 234 on the move, I have many to chose from. 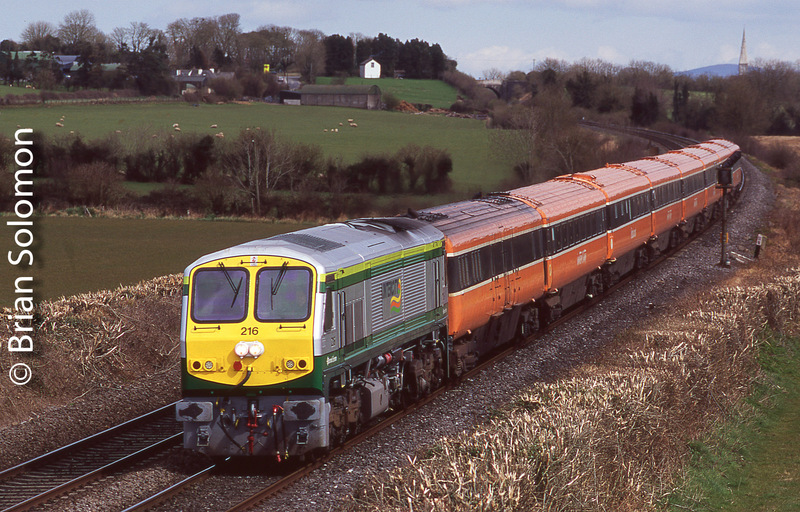 Here I present two: one in the classic orange livery from 2005, and a recent view in green and silver. 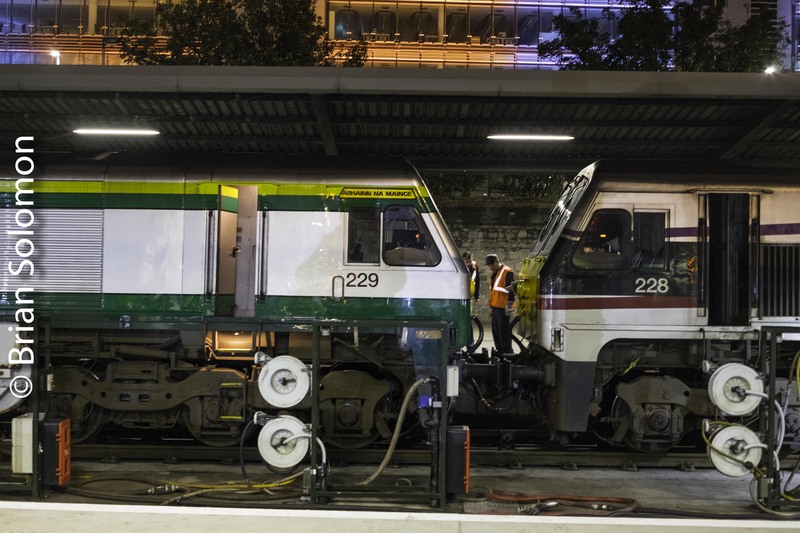 Two in One (view); Class 201s 228 and 229 together on 23 September 2018. 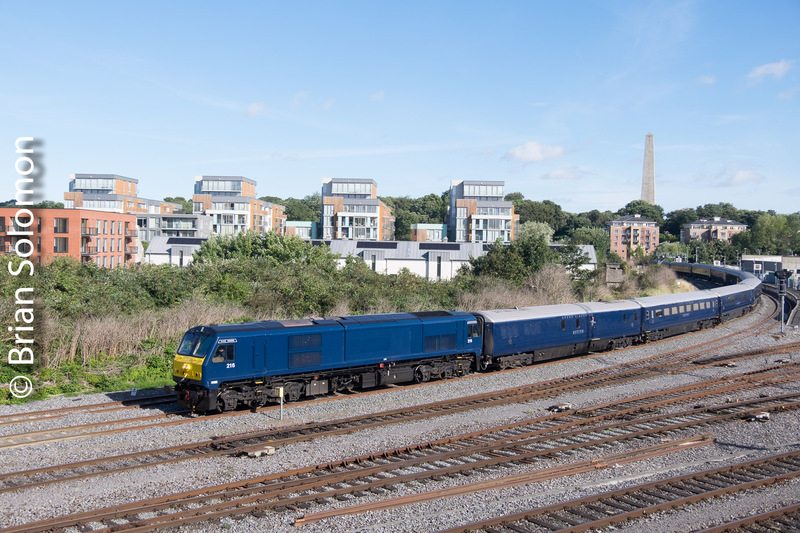 In more than 20 years of photographing Irish Rail, 23 September 2018 was the first time I’d photographed a pair of 201s together on a train. 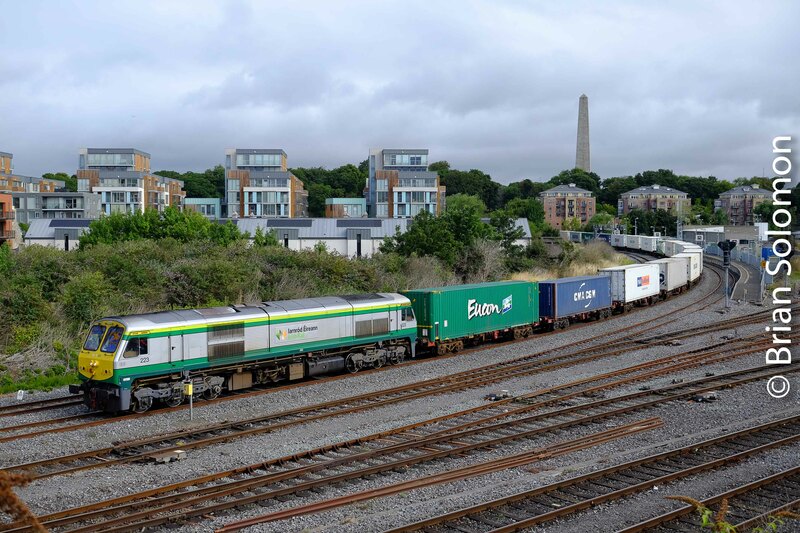 I’d been alerted by folks on the Cork-end of the railway that this unusual move was on it way to Dublin. 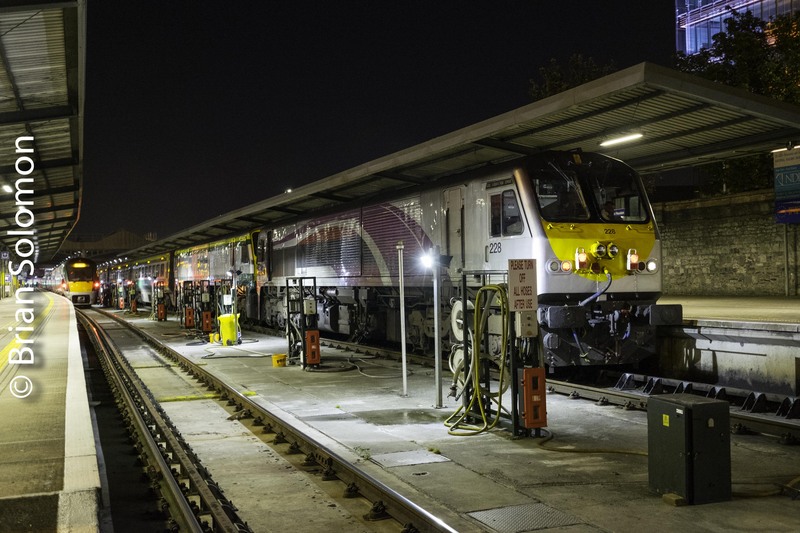 Although the Cork – Dublin Mark 4 with 229 and 228 arrived after sunset, myself and Jay Monaghan documented this unusual occurrence at Heuston Station. 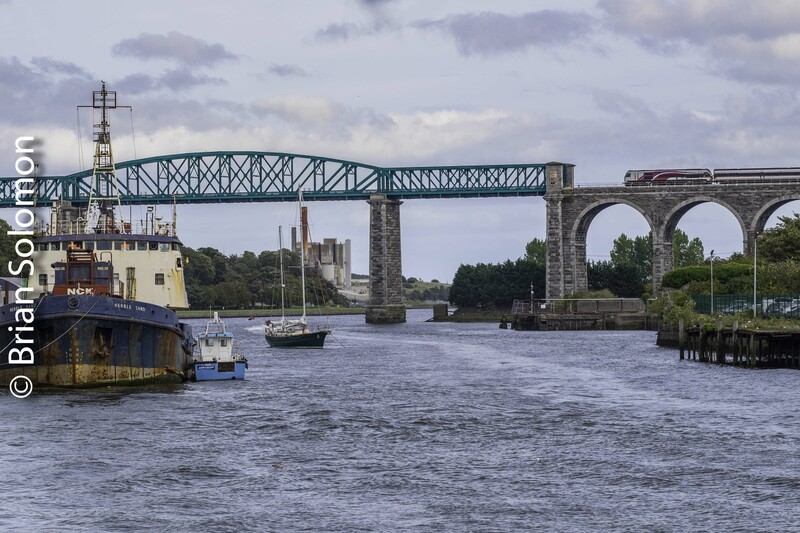 I made photos using my FujiFilm XT1 and Lumix LX7 digital cameras. 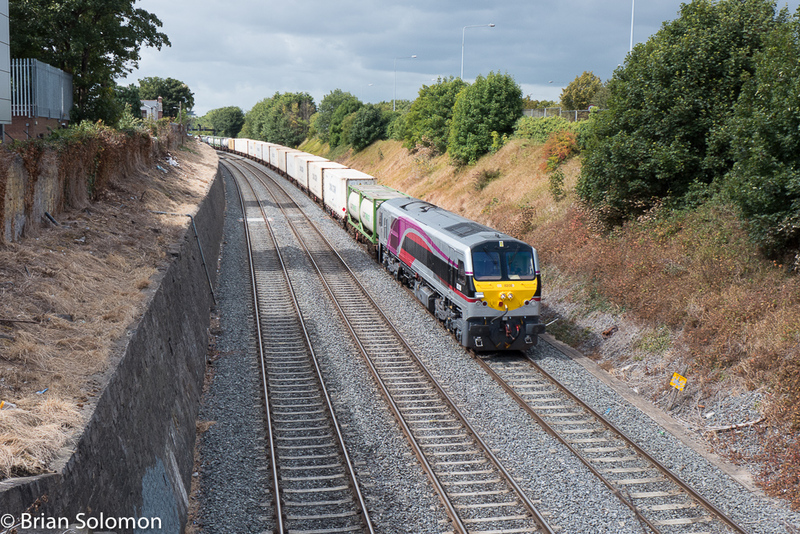 Successfully capturing unusual or unique events are among the challenges of the railway photographer. 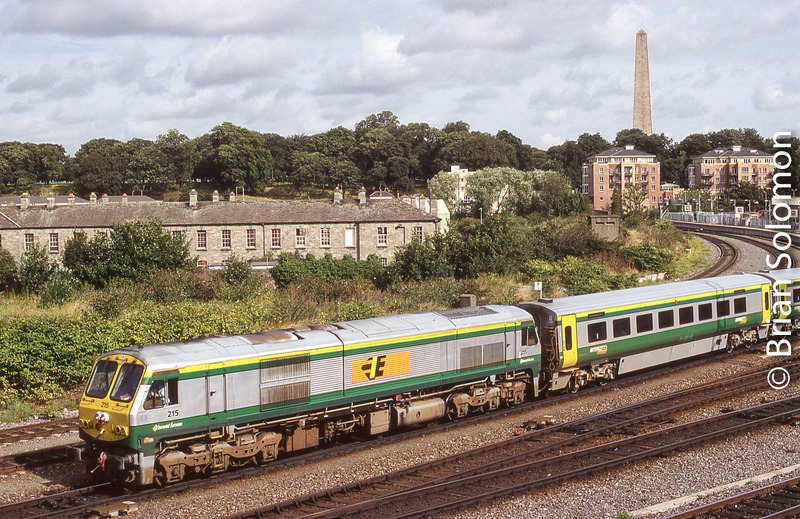 Irish Rail 223 Then and Now. 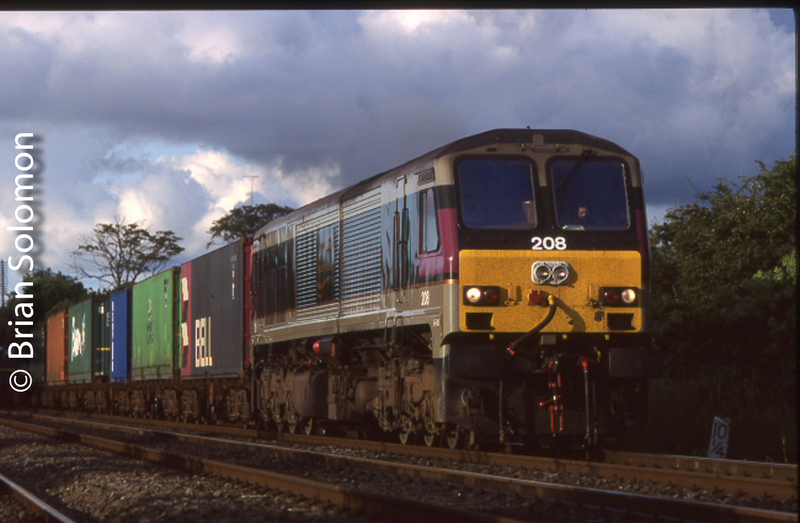 As it happens, Irish Rail 223 was one of the first Irish locomotives I put on film. 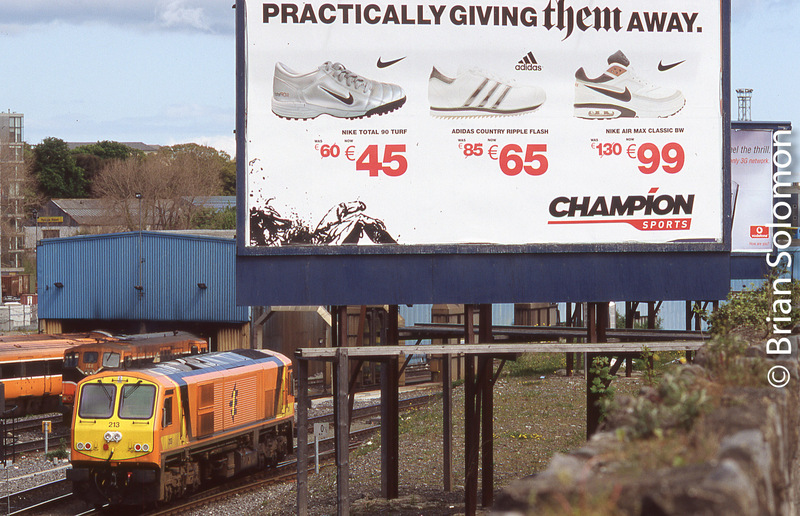 I made this view at Tralee back in February 1998. 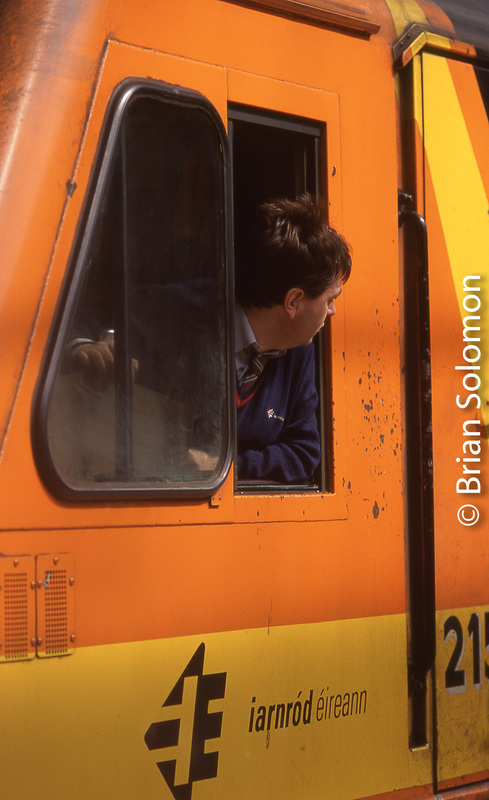 Expose with a Nikon F3T on Fujichrome slide film. 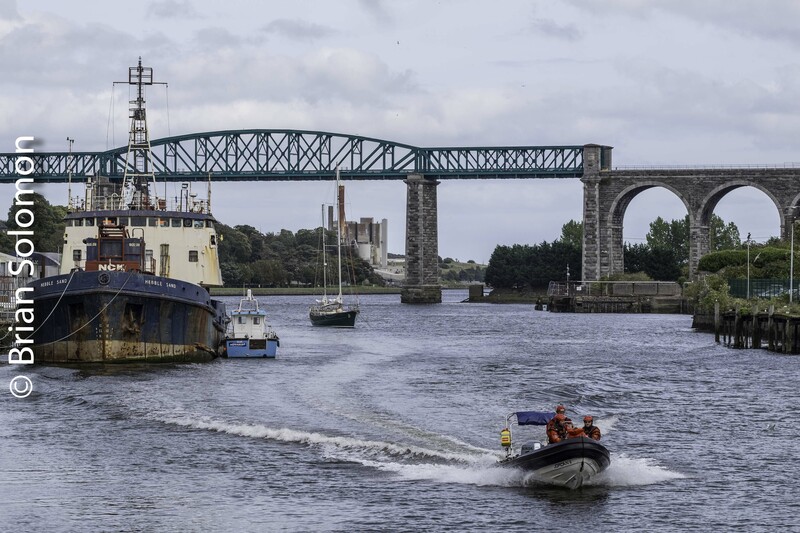 Additional views of 223 were exposed digitally in recent weeks. 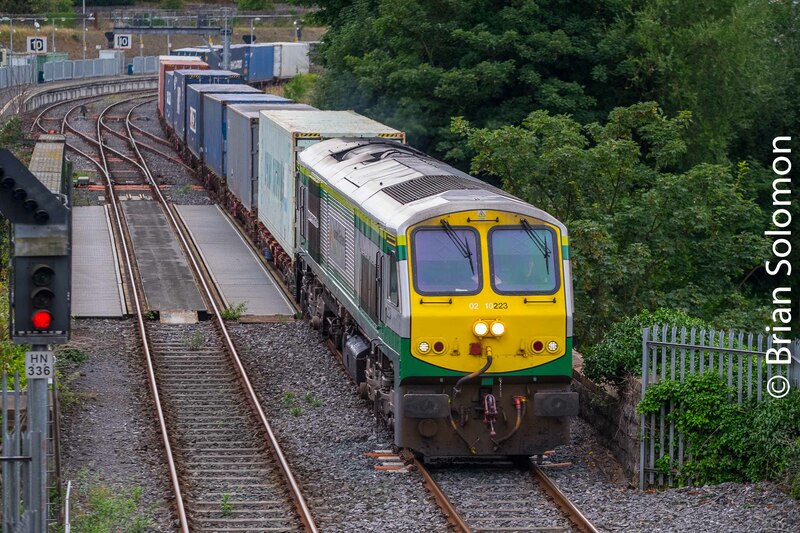 Irish Rail 223 leads the up IWT liner from Ballina at Islandbridge in Dublin on a August 2018 evening. 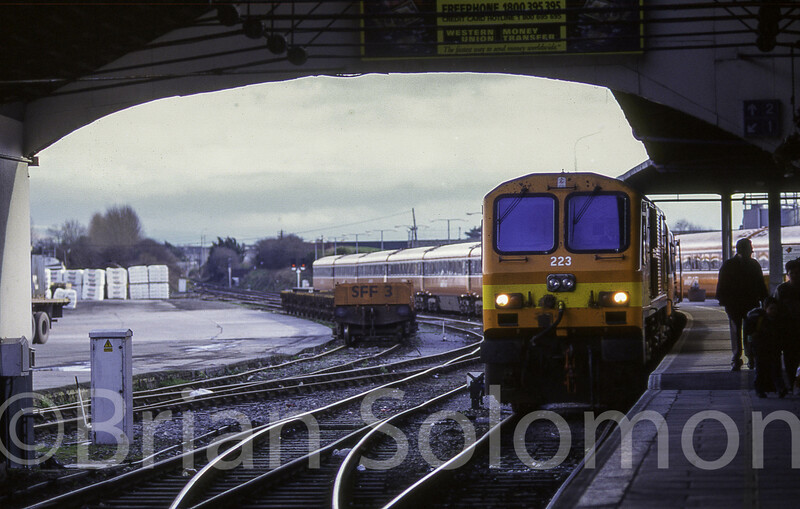 The next day, 223 works the down IWT liner at Islandbridge Junction. 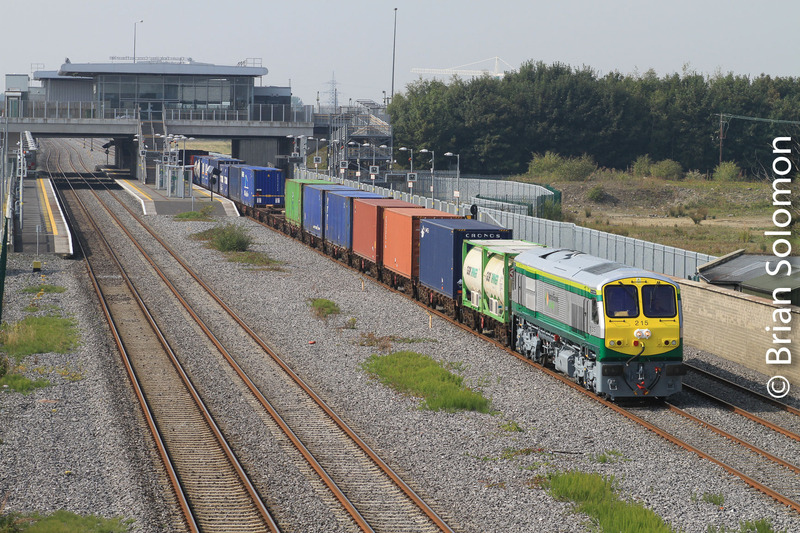 One a locomotive is assigned to the IWT liner it often works if for several days in a row. 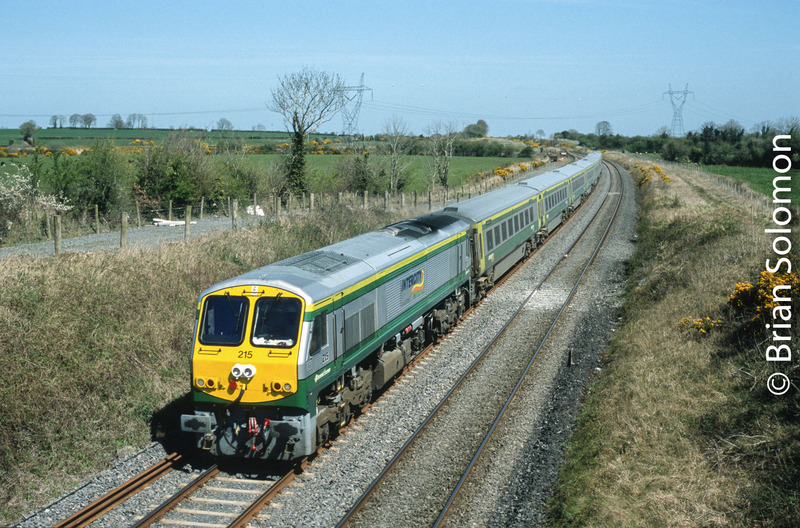 Comparatively little rolling stock in service back in 1998 remain active on Irish Rail today. 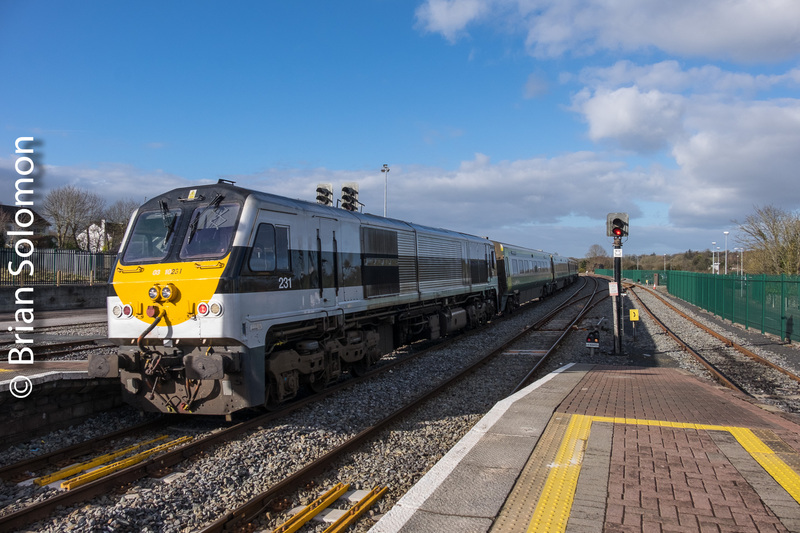 Who could have guessed that I’d be making photos of Irish Rail 223 more than 20 years after I caught it at Tralee on that cloudy Febraury morning! 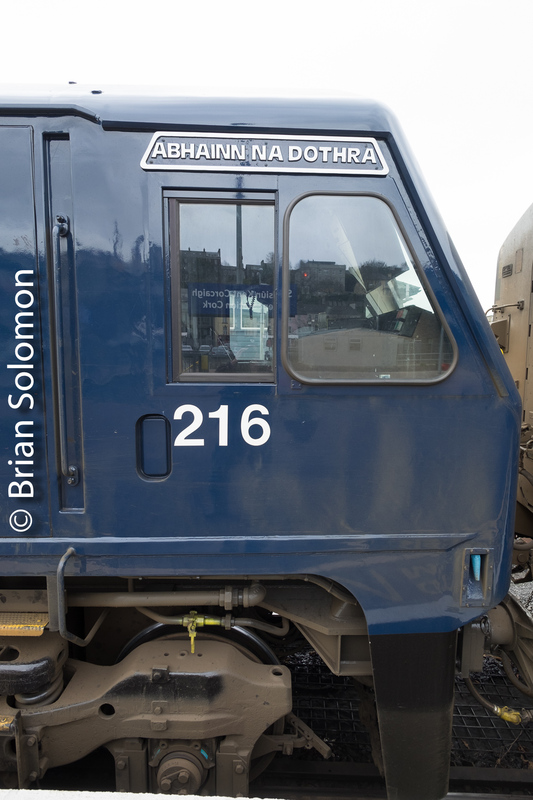 Many Irish Rail locomotives have nicknames. 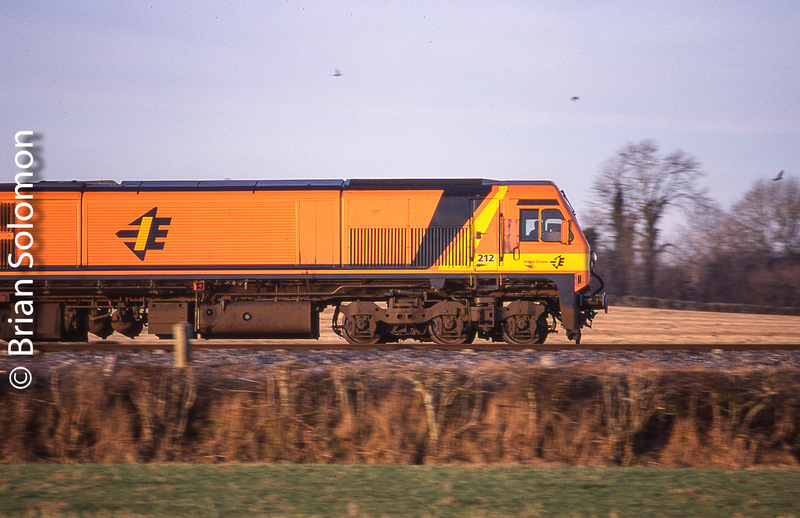 Engine 222 is ‘The Bishop’ or ‘Bishop Tutu’, which is an allusion to its number. 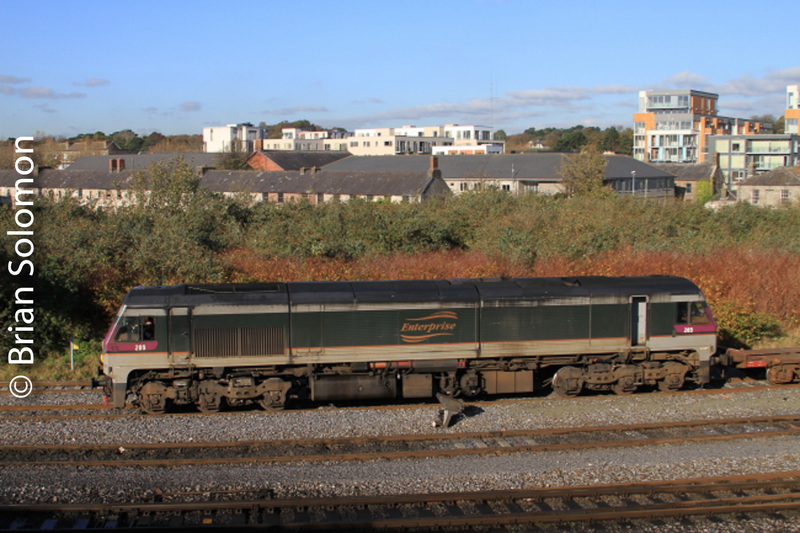 Over the last 20 years, I’ve caught this locomotive at many places across the Irish network. 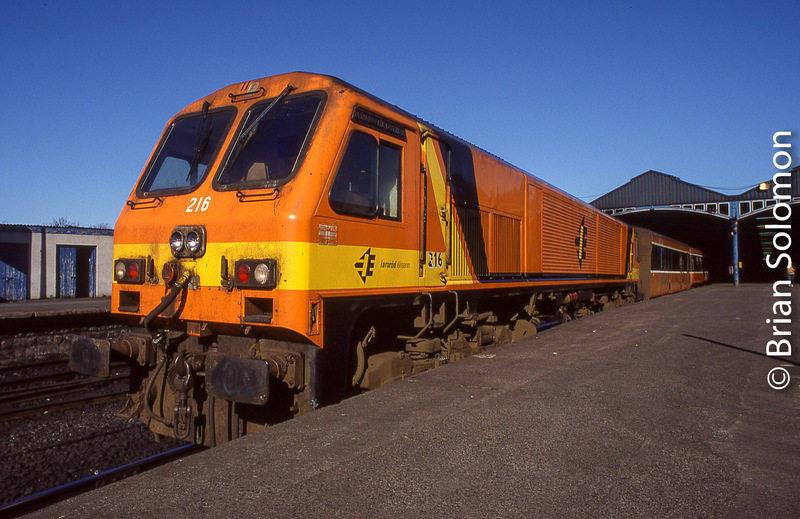 Irish Rail 222 working push-pull set at Cherryville Junction on 20 September 2002. Exposed on Fujichrome with a Nikon. 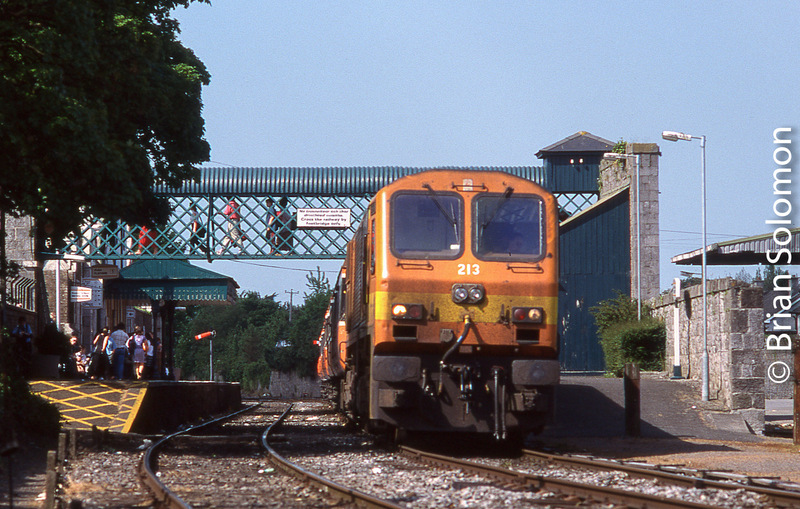 10 June 2006; An electrical power cut at Westport, County Mayo had required the use of portable generators at the station. 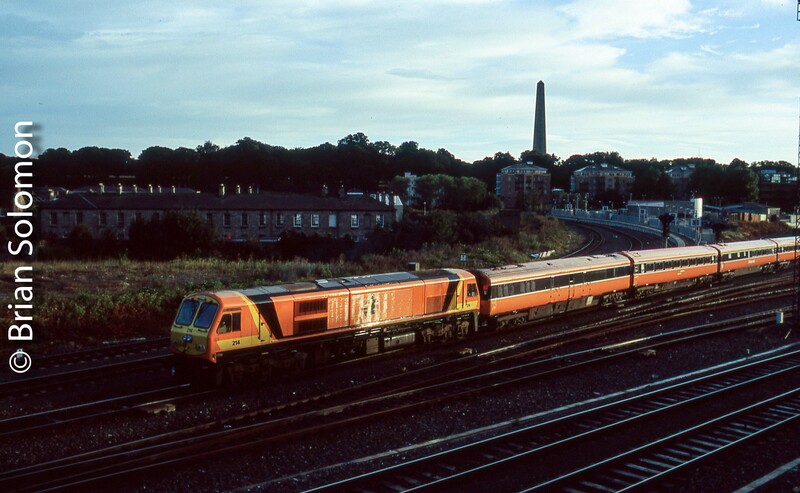 In addition to the discordant cacophony at the normally peaceful location, this had resulted in some unusual moves to get trains positioned properly, such as this view of 222 with Mark 3s beyond the station to the West. 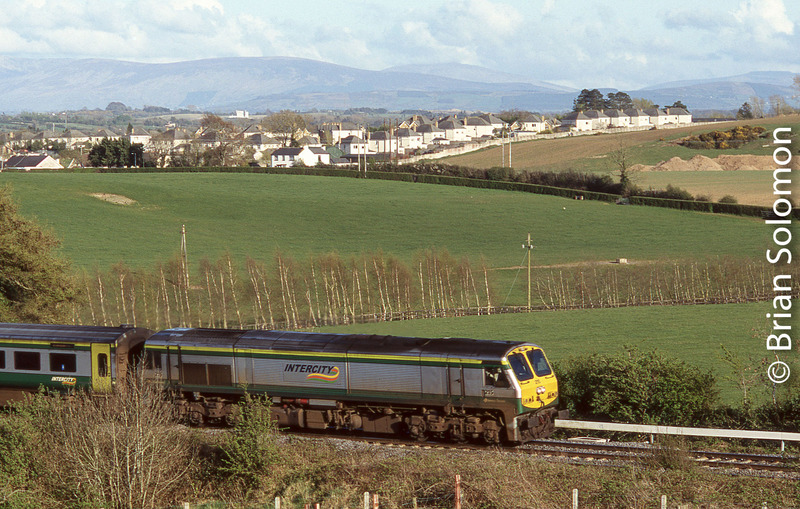 Irish Rail 222 works a Dublin to Cork Mark4 set nearing Kent Station, Cork. Now officially 02-10222. 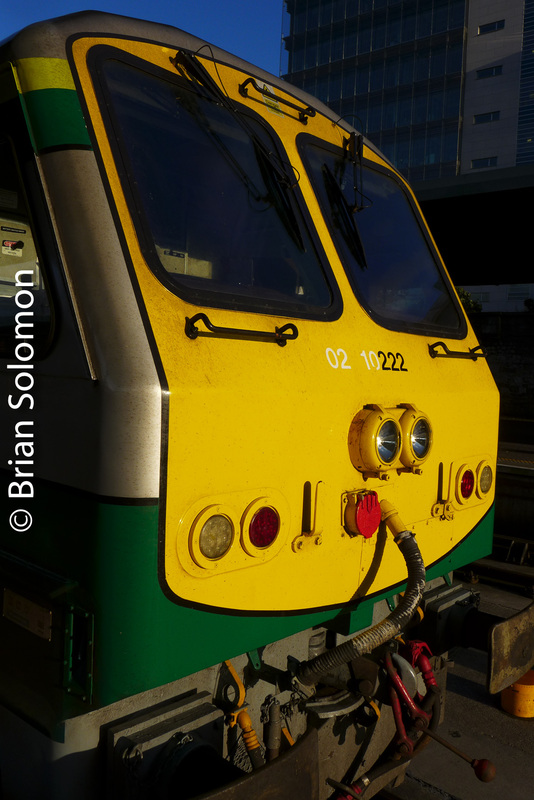 The Bishop basks in the evening sun at Heuston Station in Dublin. 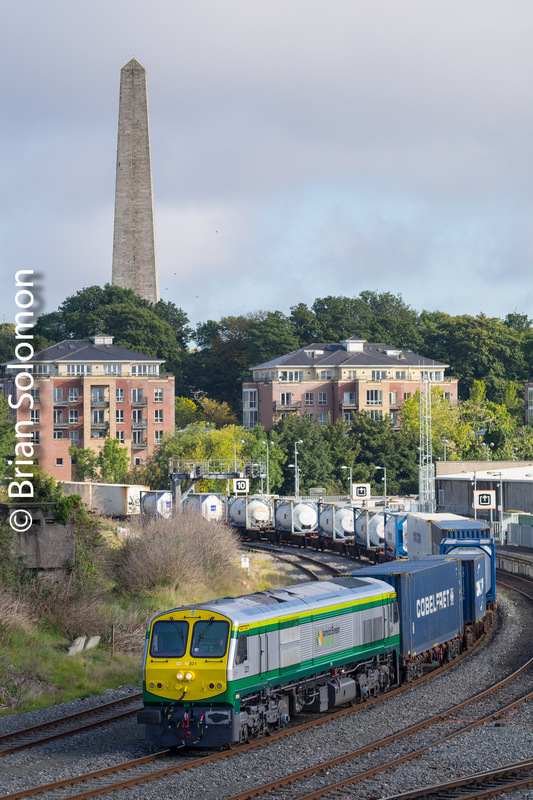 Working the IWT liner from Dublin to Ballina, at my all to often photographed location at Islandbridge in Dublin. Exposed digitally using my FujiFilm XT1. 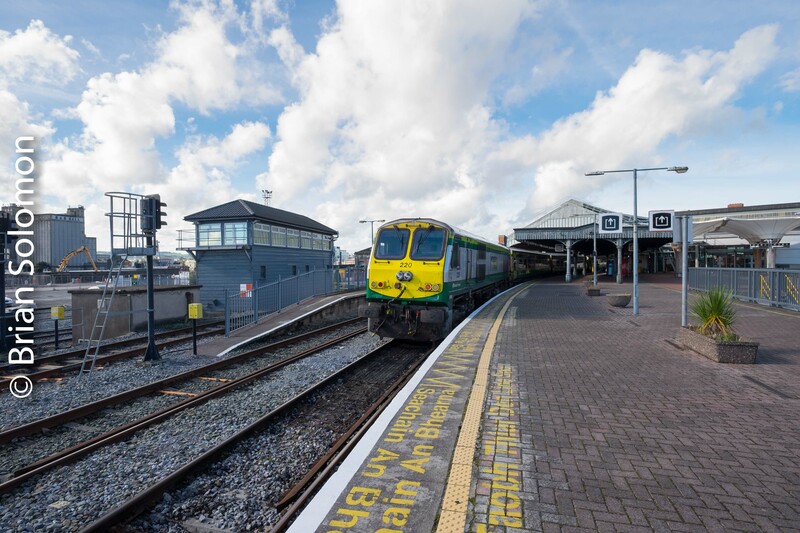 Irish Rail Workhorse Diesel; The Unremarked 221 in four photos. 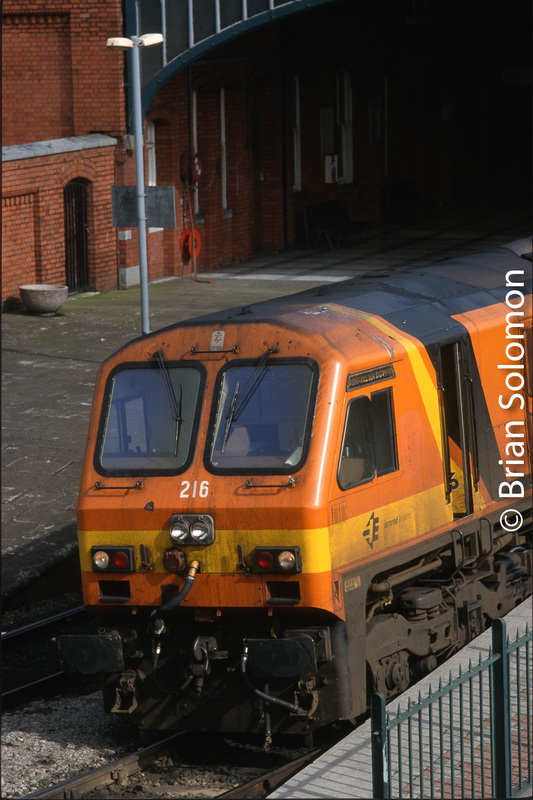 Here’s four views of Irish Rail 221; two film, two digital; two orange, two green & silver; two with passenger, two with freight; one in snow, three without; but all showing this machine on the move. 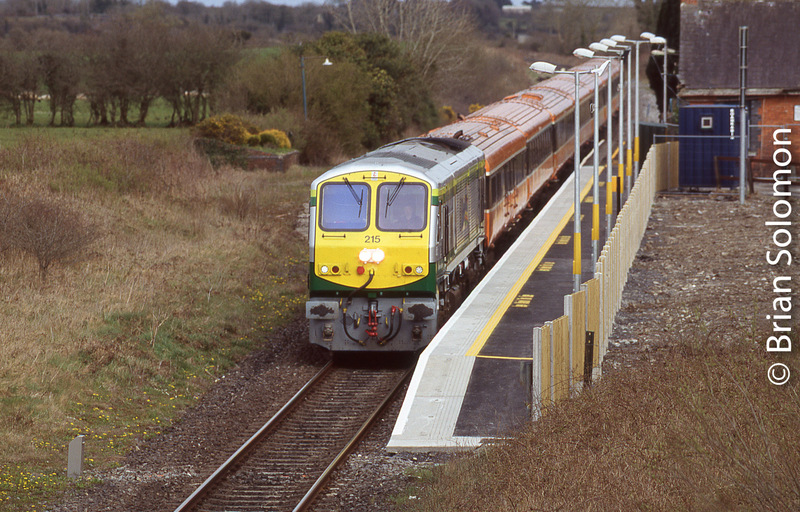 221 leads the down Dublin-Cork liner at Ballybrophy on 25 March 2005. Exposed on Fujichrome Velvia 100F using a Nikon F3 with 180mm lens. 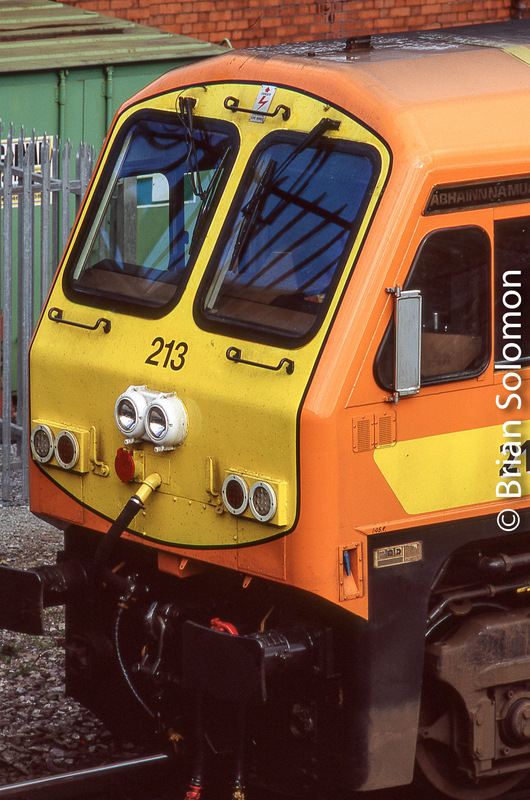 This is part of my on-going series depicting Ireland’s class 201 diesel electrics to mark my 20 years photographing in Ireland. 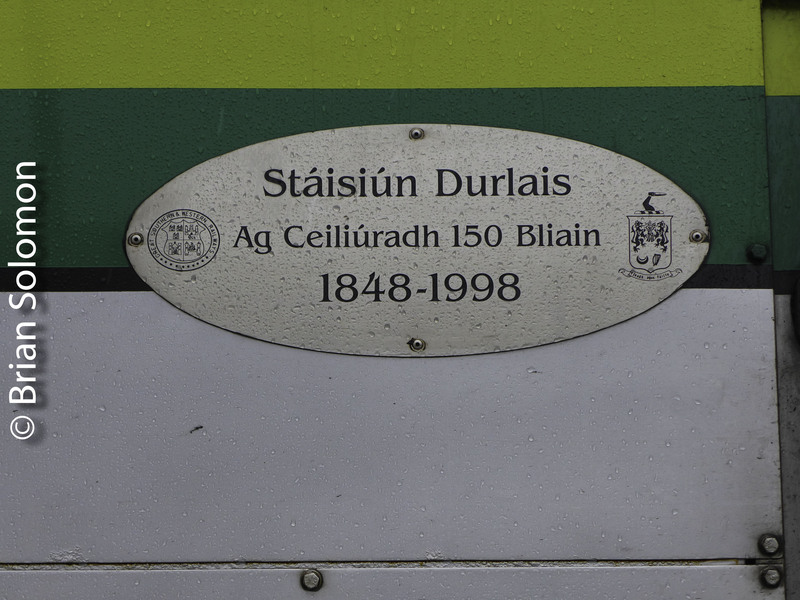 Photographic details in the captions. 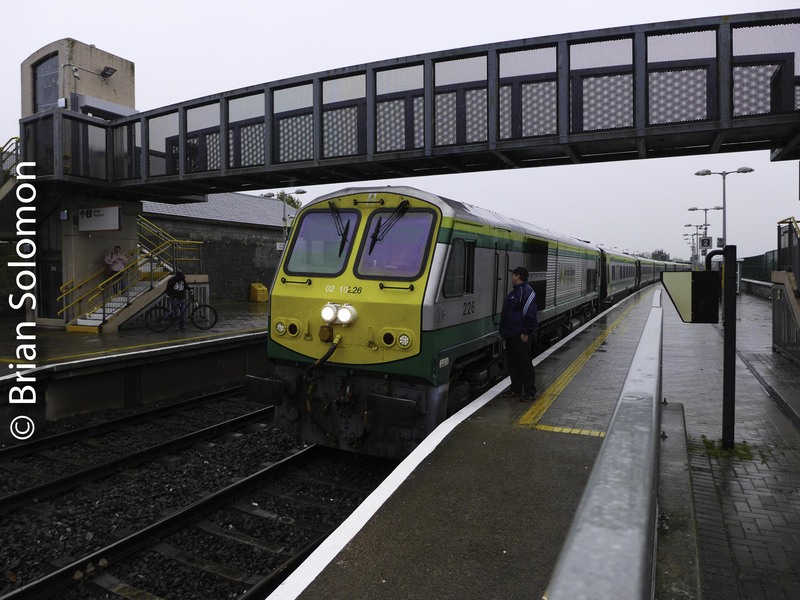 Irish Rail 221 leading Mark 3 carriages at Kildare on a damp summer day in 2005. Exposed on Fujichrome Velvia 100F using a Nikon F3 with 180mm lens. 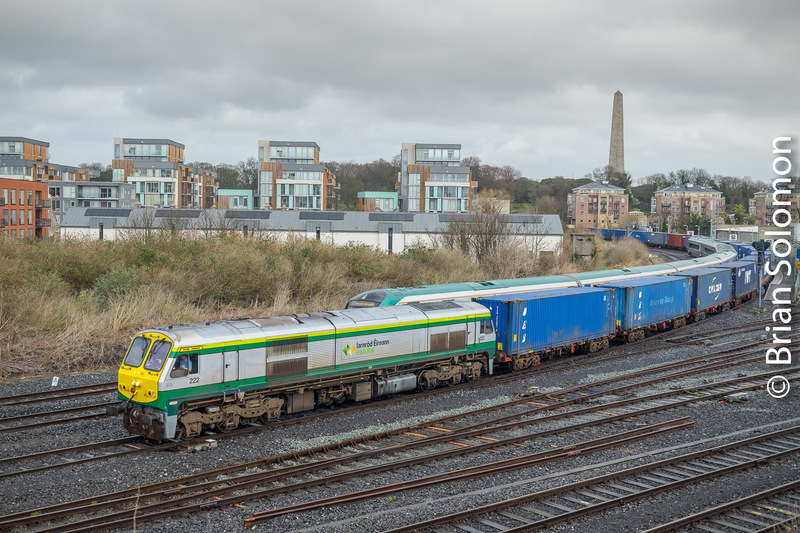 Freshly painted 221 (with expanded number) leads the down IWT liner (Dublin to Ballina container train) at Islandbridge Junction in Dublin. Exposed digitally using a FuijFilm XT1 with 90mm Fujinon telephoto lens. 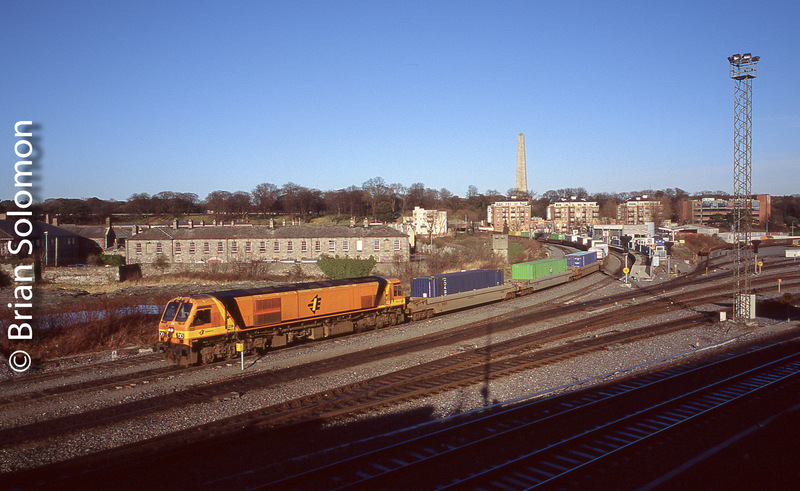 Notice the effect of scale with the monument visually positioned over the locomotive. The date of exposure was 21 September 2017. 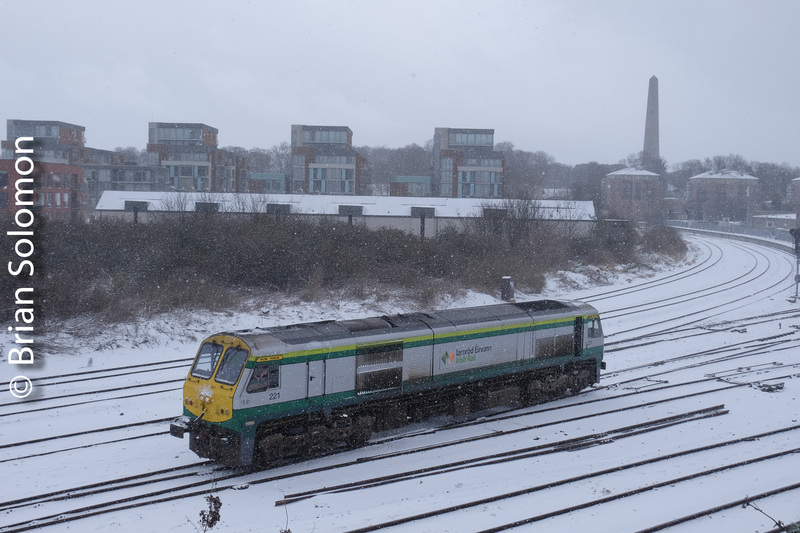 Irish Rail 221 in the snow at Islandbridge in Dublin on 28 February 2018. Exposed digitally with a FujiFilm XT1 and 27mm pancake lens. 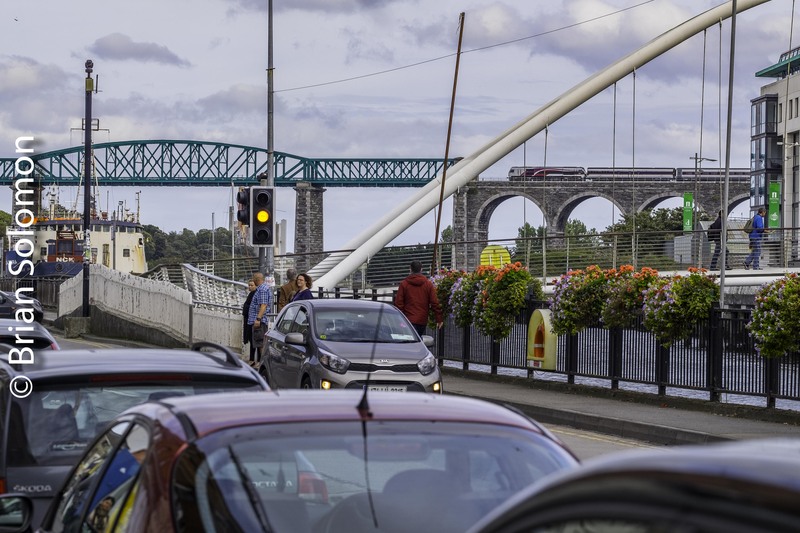 Question: do head-on telephoto views portray the shape of the 201-class effectively? 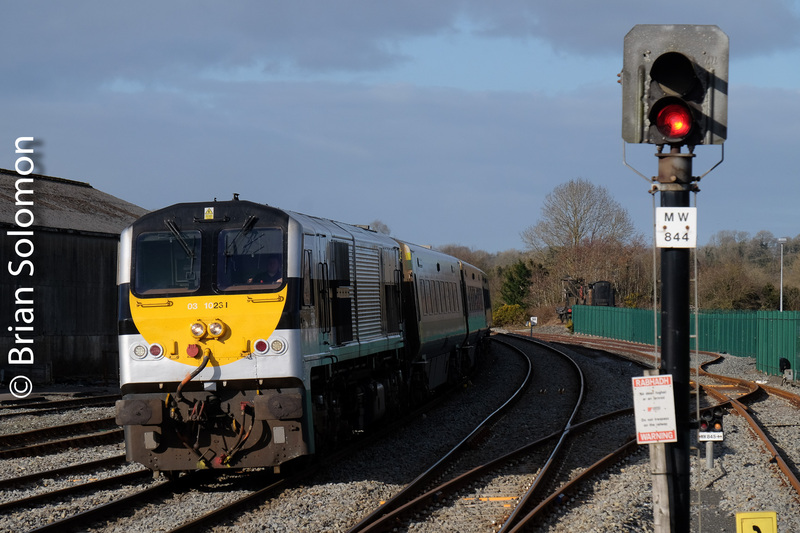 Irish Rail 212 Flying Along at Cherryville Junction. 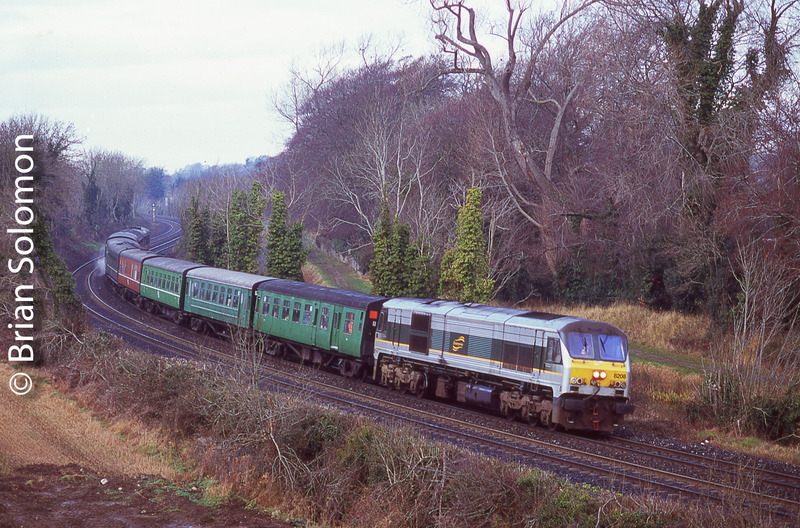 I made this panned view of Irish Rail class 201 number 212 working up-road at Cherryville Junction on 11 January 2003. 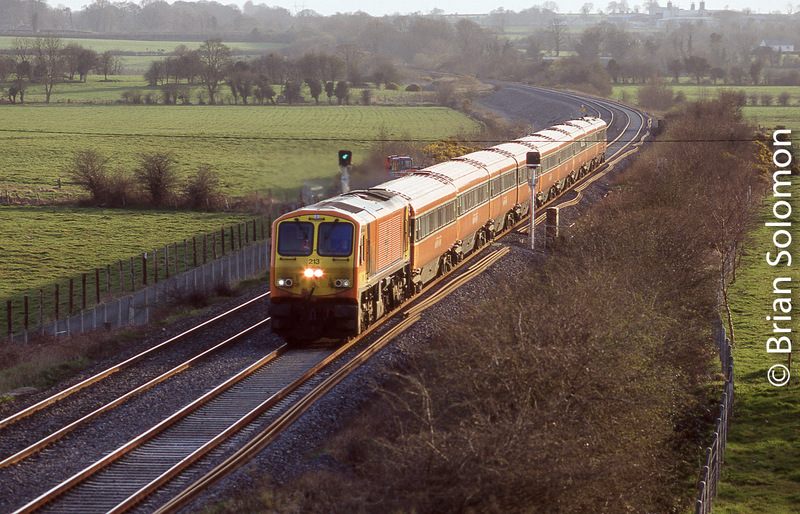 Blurred birds help convey the sense of speed as 212 races toward Dublin on 11 January 2003. 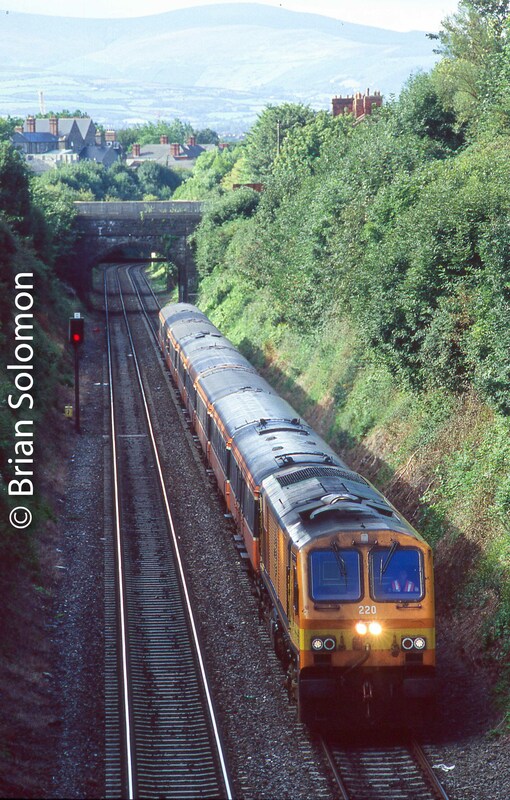 This is part of my sequence of posts commemorating 20 years of railway photography on Irish railways. 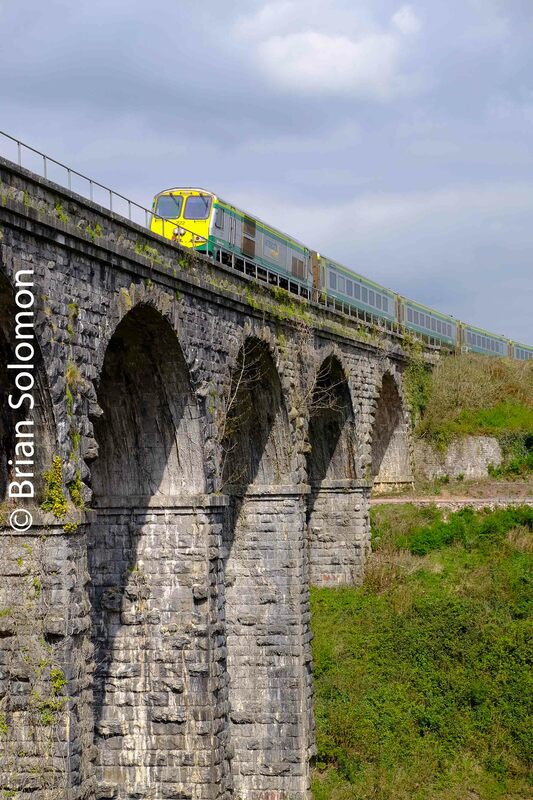 Next up is Irish Rail 213. 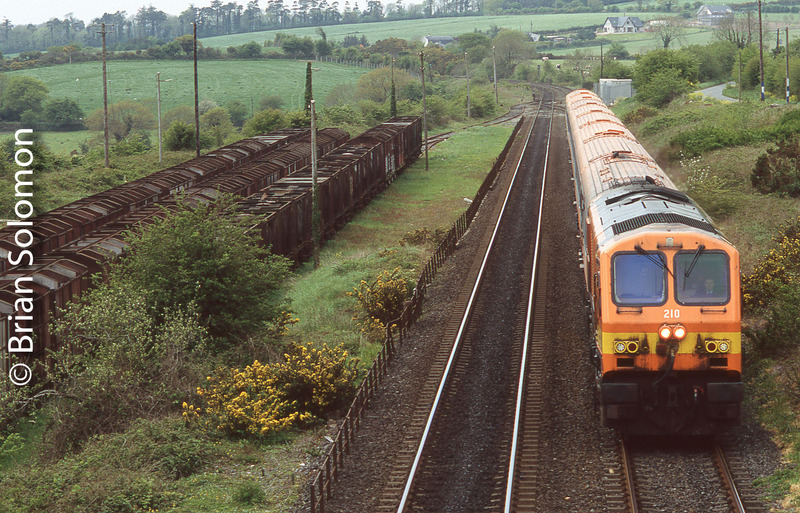 Panning is an effective technique for conveying motion. 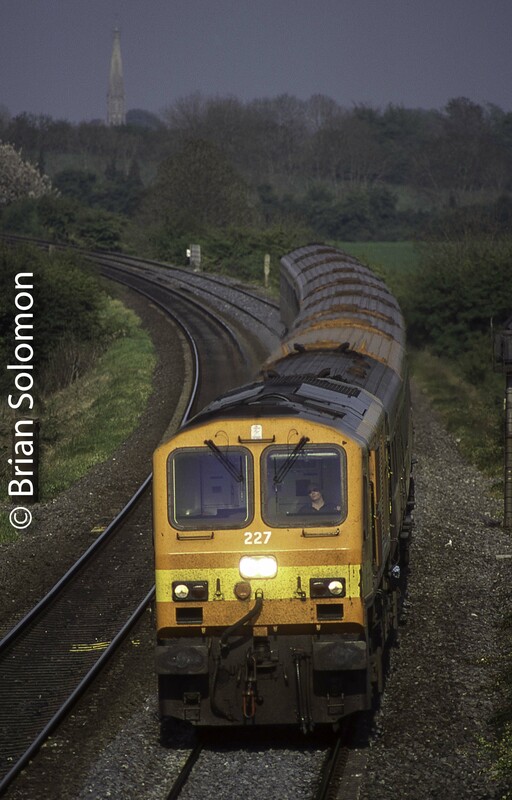 For this view I used a short telephoto lens and a comparatively slow shutter speed, probably about 1/60thof a second, while moving the camera in tandem with the locomotive. Key to making an effective pan is maintaining constant speed and smooth motion. 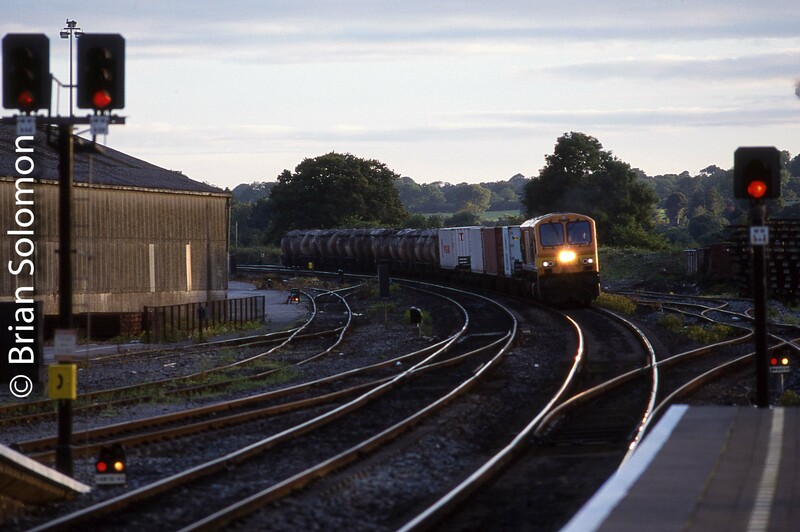 Novice panners may make the mistake of stopping panning as they release the shutter. This results in a jarring complete blur that produces something less than the intended effect. 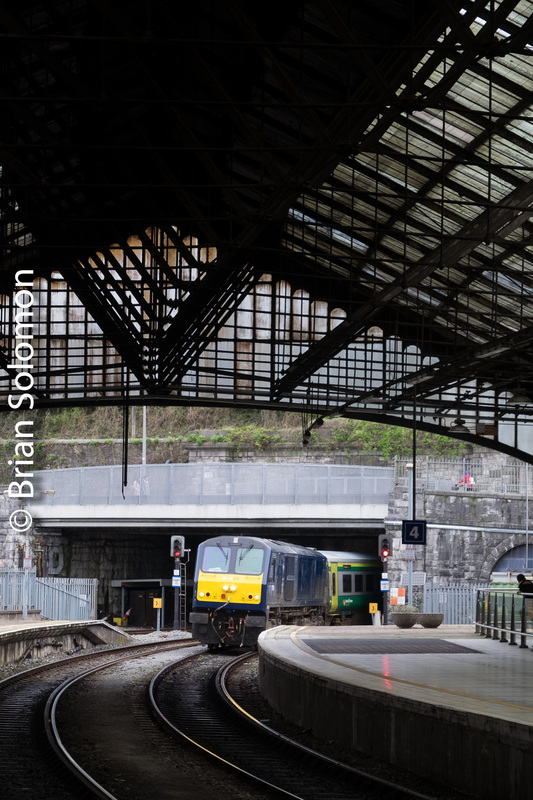 Tracking the Light Publishes New Material Each and Every Day. 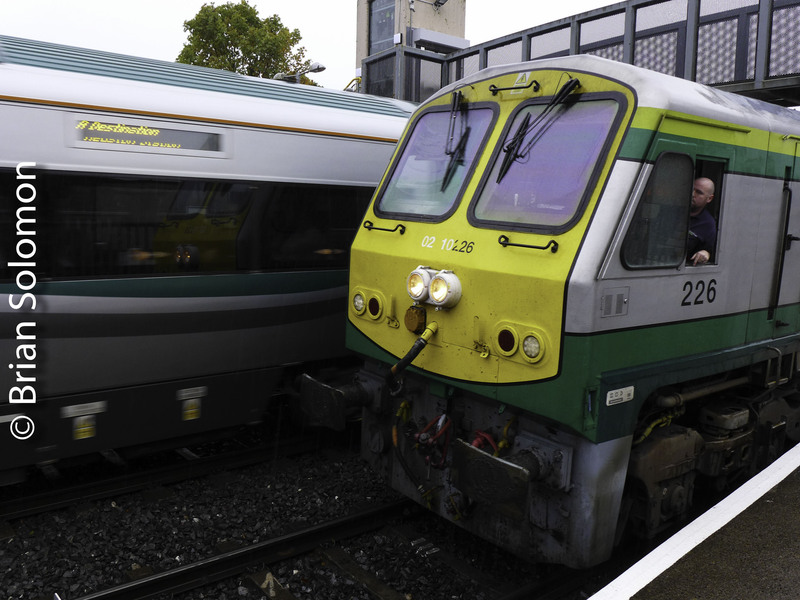 Irish Rail 210—Three Scenes NEVER to be repeated. 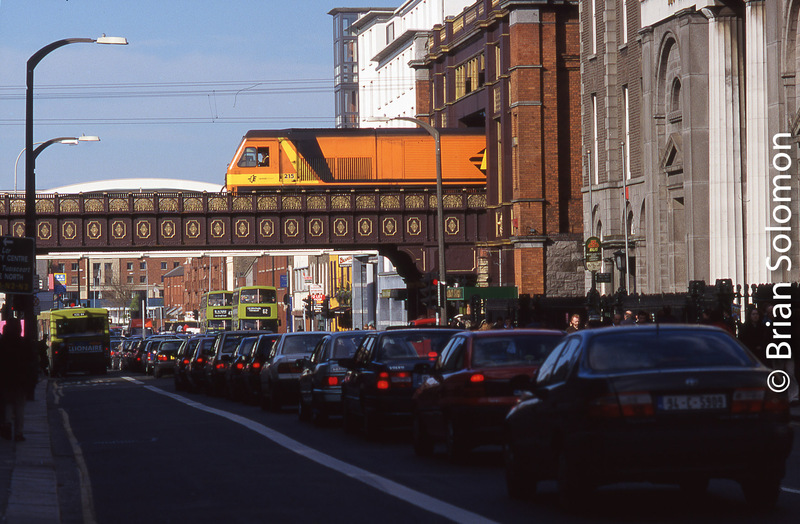 Brian’s 20 years in Ireland/class 201 numerical retrospective, part 10. 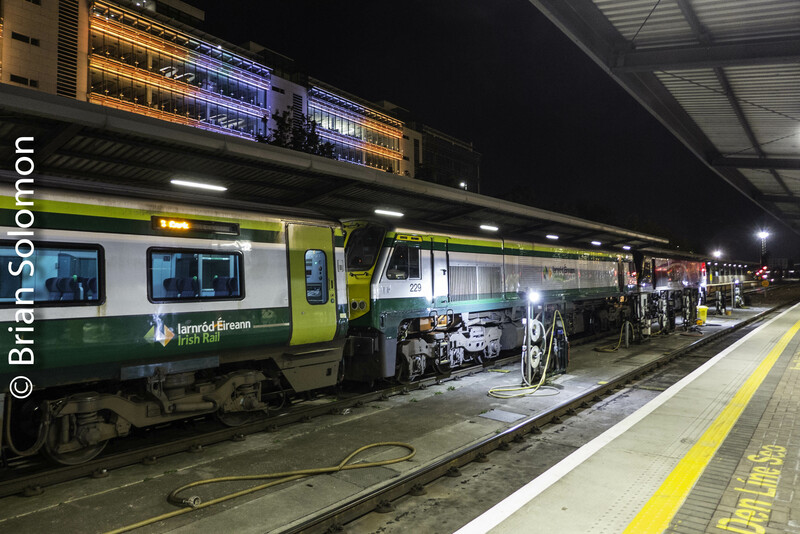 During the last 20 years an awful lot has changed at Irish Rail. 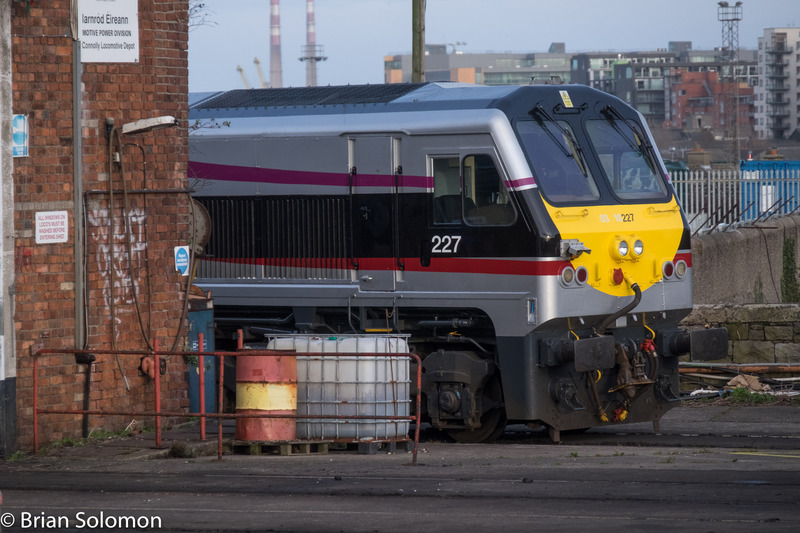 Here are three scenes never to be repeated and all featuring Irish Rail class 201 number 210—one of ten class 201 locomotives now stored at Irish Rail’s Inchicore works. 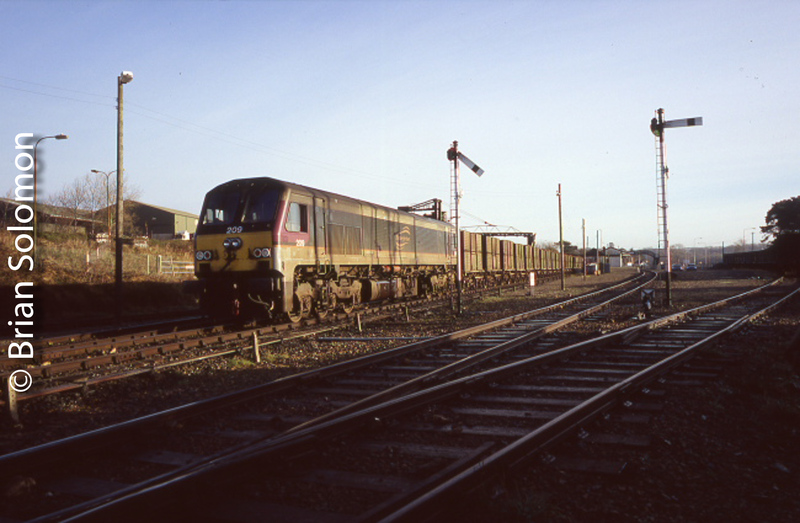 All were exposed on Fujichrome slide film using Nikon cameras. Details in the captions. 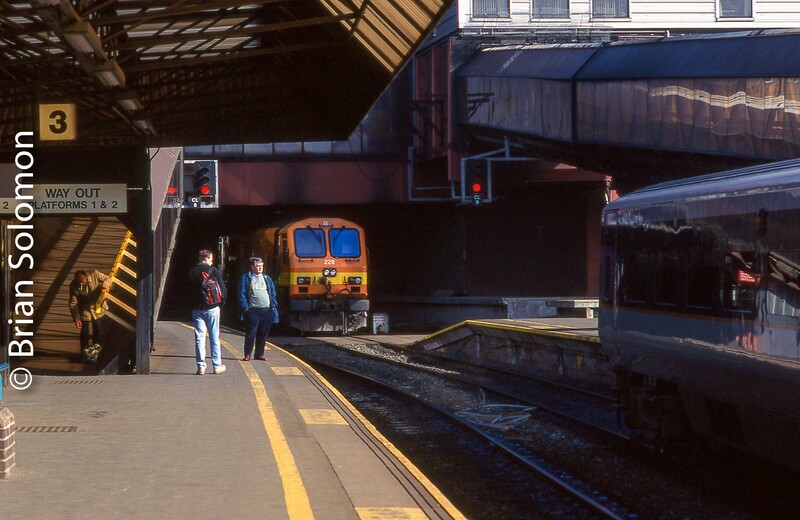 A view from 1998, not long after I made my first visit to Ireland, locomotive 210 with a set of Cravens under the train shed at Heuston Station in Dublin. 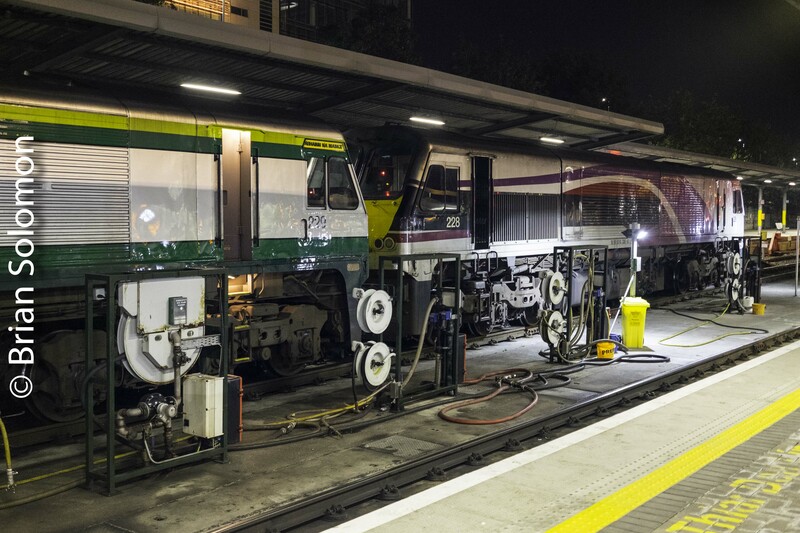 Both locomotive and train shed are covered in grime. 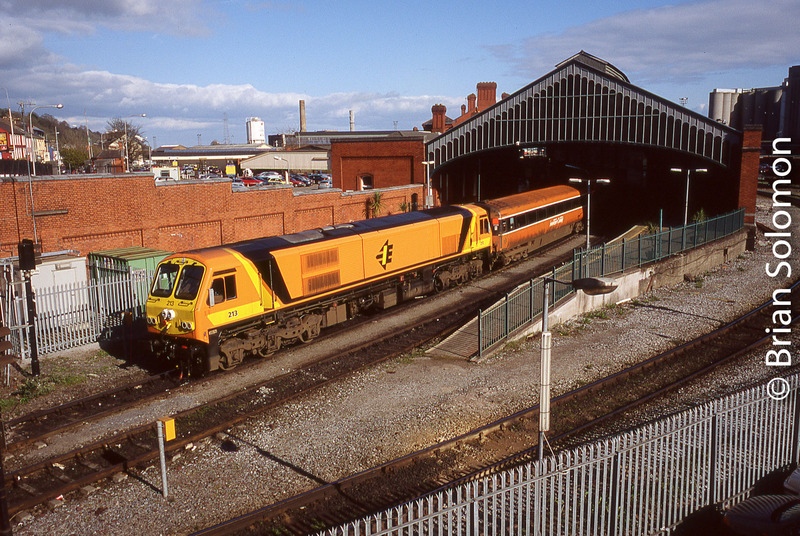 This was before the shed was renovated and the station brightened up. 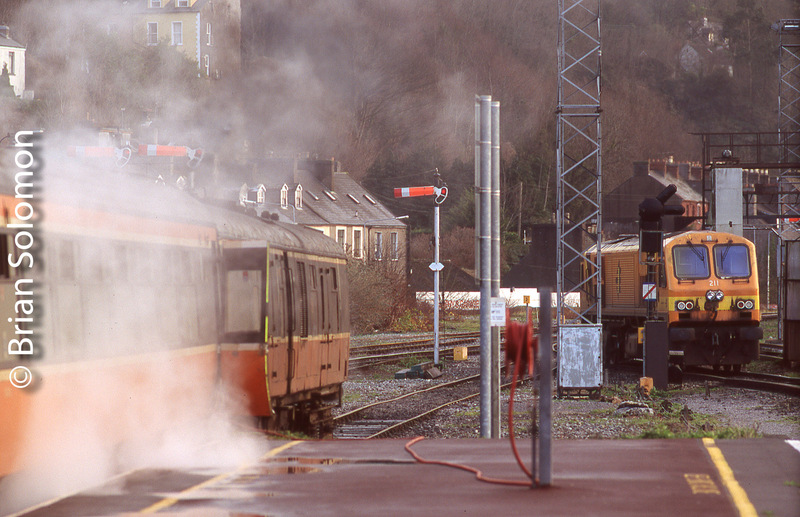 Notice the old-style lamps on the front of the loco. 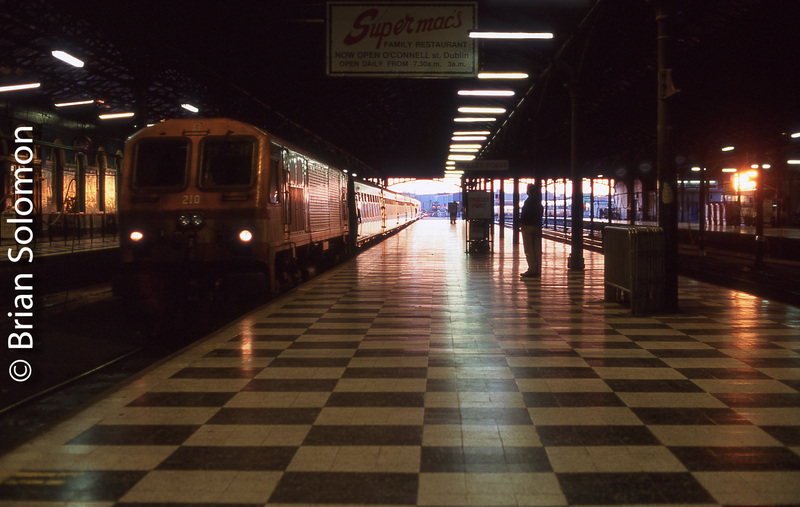 I was working with the glint effect, catching the light of the setting sun on the Cravens and interior surfaces of the station. 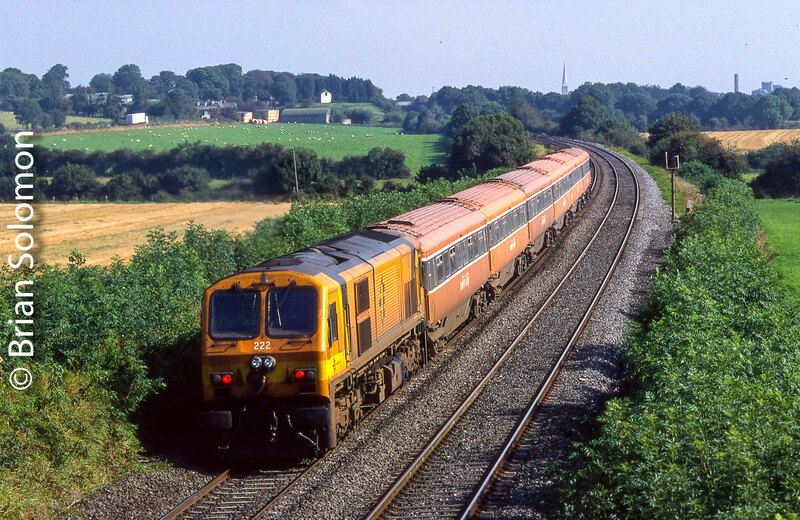 This was 11 May 2000. 18 Years ago. 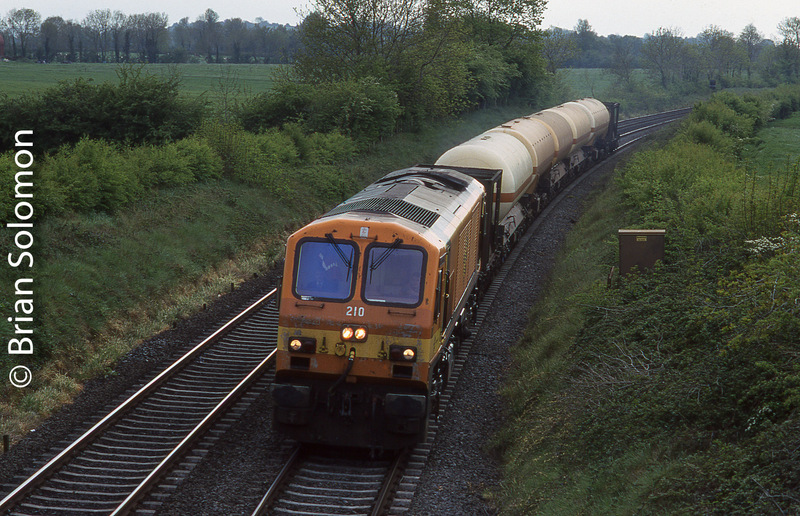 Locomotive 210 was working an up-Ammonia at Limerick Junction. 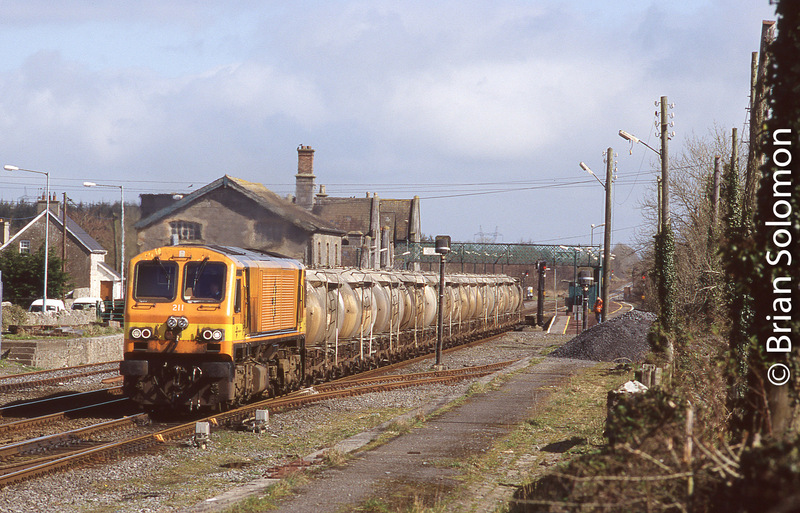 The Ammonia traffic ended in 2002. 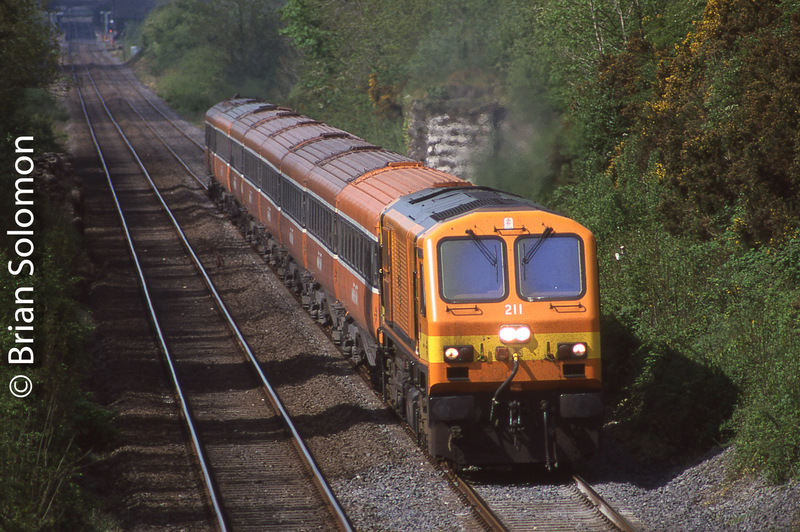 On 13 May 2005, 210 works a down Dublin-Cork train at Rathpeacon. 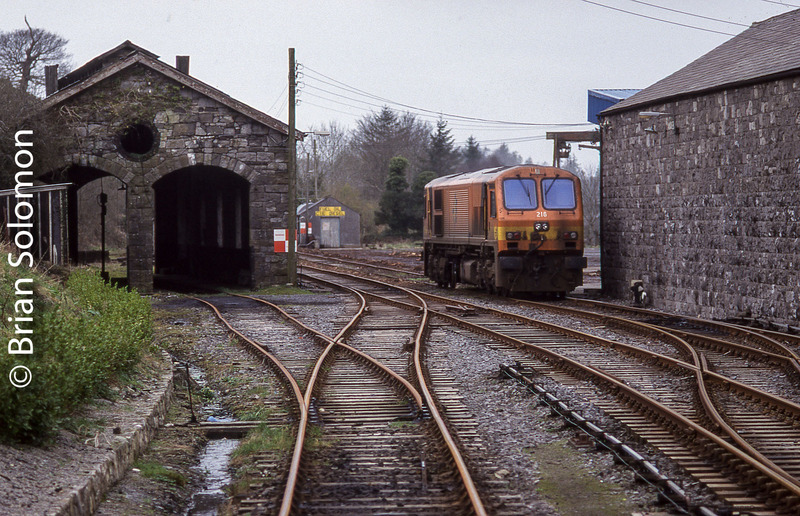 Stored fertilizer wagons occupy the sidings at the left. 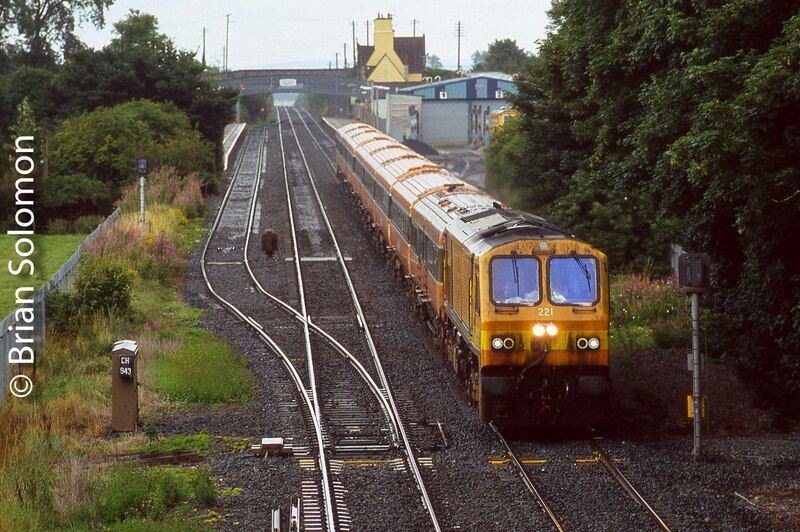 Since this photo was made the sidings at Rathpeacon have been removed and the old wagons scrapped. 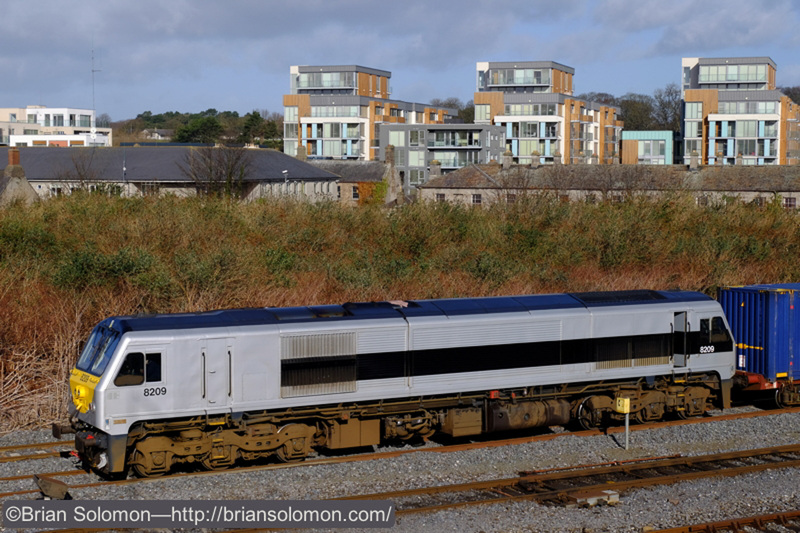 201 Retrospective: 209 in the Most Unlikely Place. 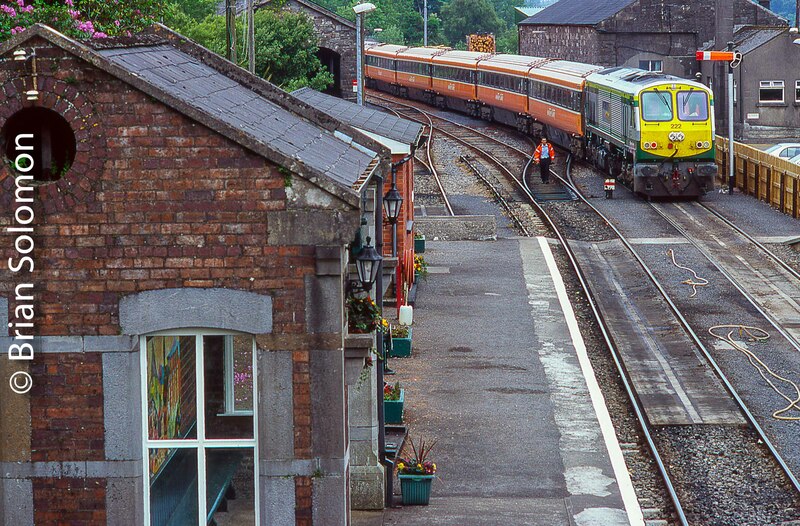 Continuing my 20 years in Ireland/class 201 numerical retrospective, I’m featuring loco 209 in a most unlikely place. 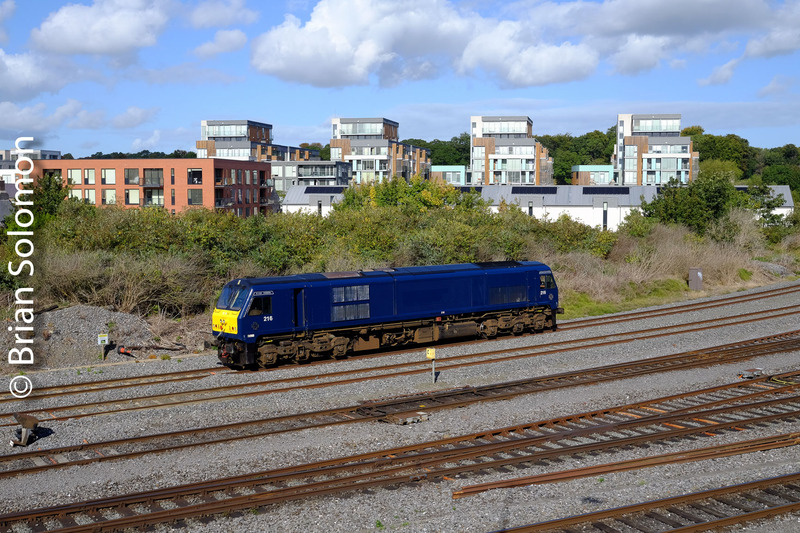 Hint, if you are not viewing this post on Brian Solomon’s Tracking the Light, you’ll need to click the link or all you’ll see is a view of this locomotive at Islandbridge Junction in Dublin! 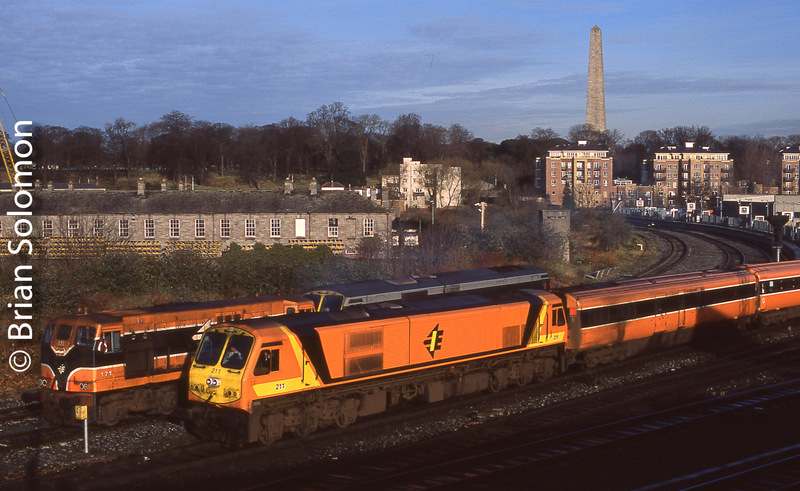 Locomotive 209 in the old Enterprise livery at Islandbridge Junction. 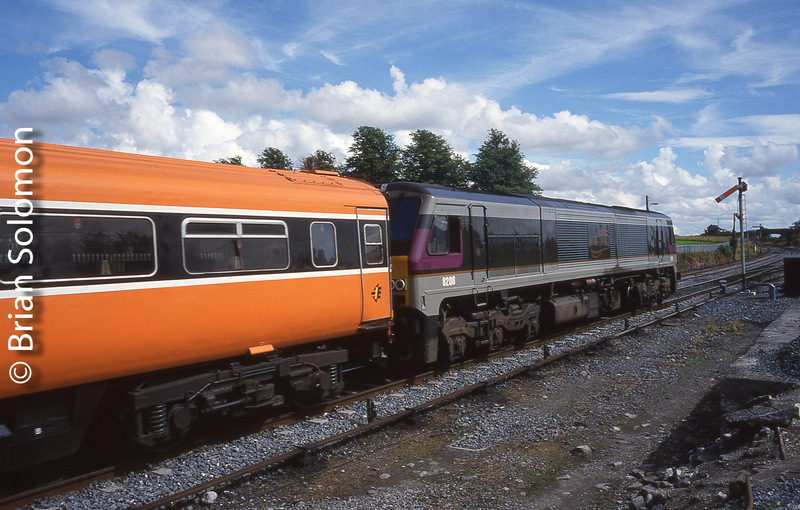 Same locomotive, same place, but wearing an interim livery before being painted in the current Enterprise livery, and carrying the number 8209 in stead its old 209 id. 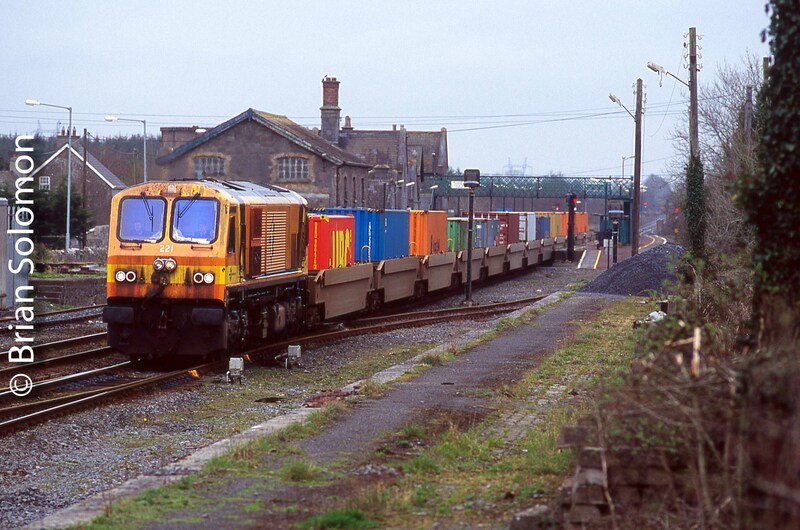 Irish Rail 209 at Wellingtonbridge 24 Nov 2003 working a sugar beet train destined for Mallow Co. Cork. 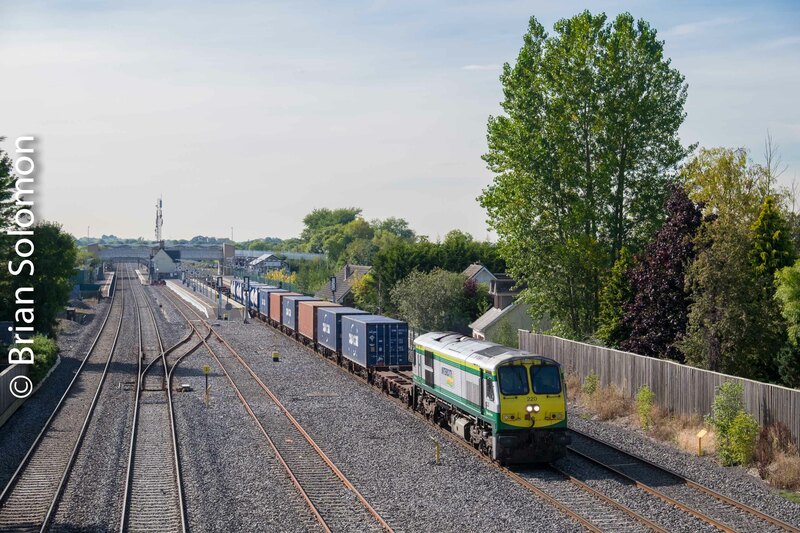 At this time, the line from Waterford to Limerick Junction was shut owing to a bridge collapse at Cahir and sugar beet trains were running via Kildare. 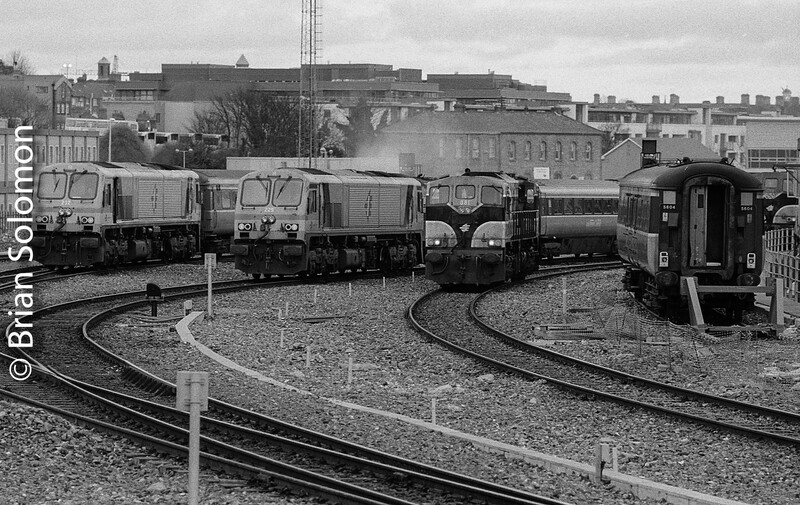 As a result, some 201 class locomotives worked beet trains. 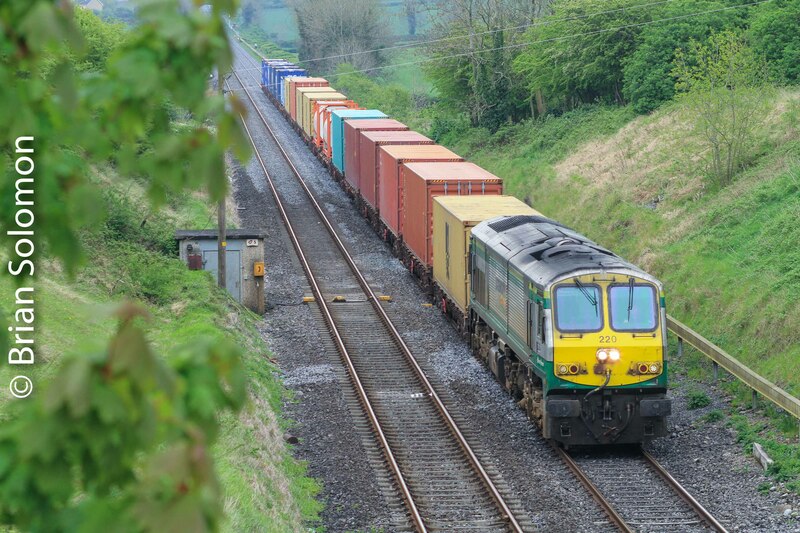 This was the only time I ever saw an Enterprise 201 on the South Wexford line.